After you have set up your app to send push notifications and set a default language, you can click the "Push" tab and choose New Push Campaign to send your first push notification. The first step in creating a campaign is to give it a name. Keep in mind that it is how you are going to be able to distinguish it from the many others you are going ti create, so try to be as specific as possible. You can simply attach a label to a push campaign via the Associate labels button. Then you will be able to associate as many labels as you want to a campaign. Marketing pressure limit: You can set a specific marketing pressure limit on all the campaigns attached to the same label (e.g. 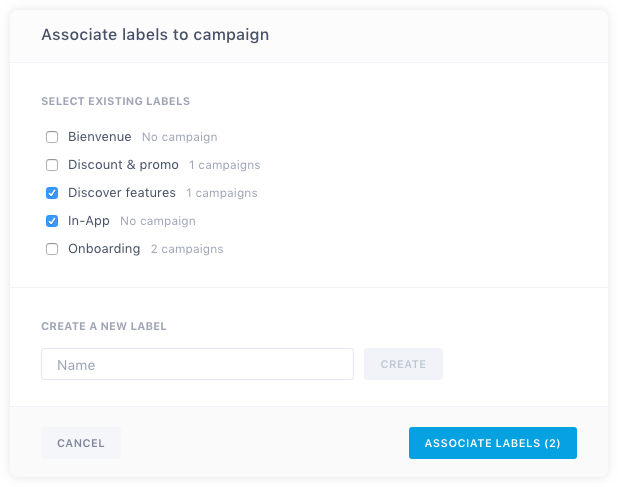 no more than 1 push a week for all campaigns using the "onboarding campaigns" label). You will find more information here: global frequency capping. In case you are using Batch's APIs, you can also attach one or several labels to a campaign created from the Campaigns API or to notifications sent from the Transactional API. Please note that labels are an optional feature, reach out to Batch support team at support@batch.com for more information about it.